-- Select a Size -- 5/8" x 4' Length - Out of Stock! 5/8" x 6' Length - Out of Stock! 1" x 6' Length - Out of Stock! Searching for a classic nylon dog leash in a lovely hue? Look no further than our Zack & Zoey Nylon Dog Leash in Raspberry Sorbet! Add some durability and classic style to your walks with our Zack & Zoey Raspberry Sorbet Nylon Leash. 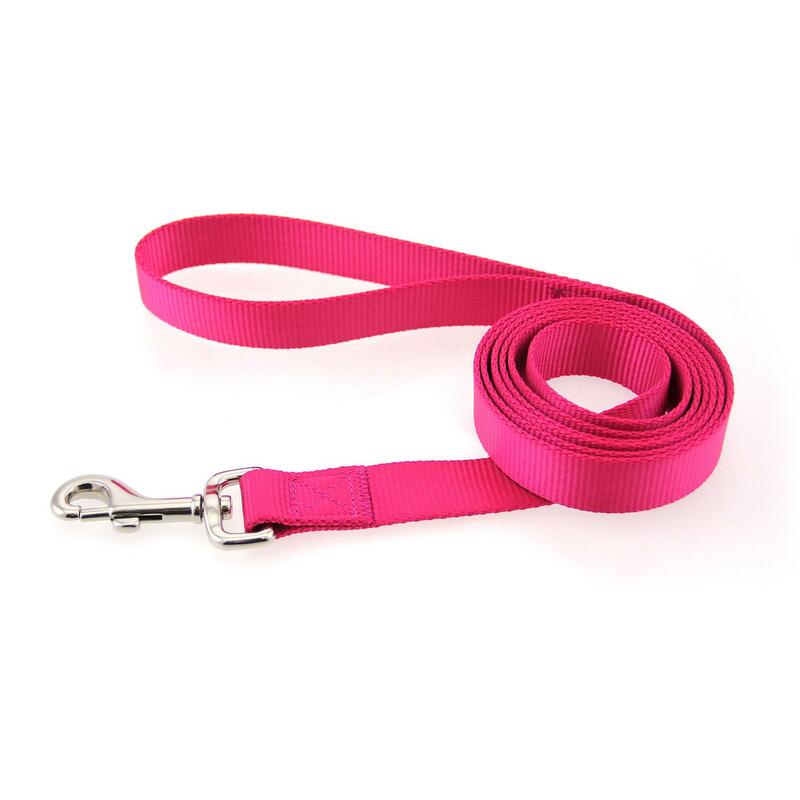 This hot pink nylon leash will be a staple for any dog or cat's walking wardrobe. Each leash features a nickel-plated swivel clip for a quick and secure attachment. The bright pink color will go with anything and is a great choice for spring and summer events. This leash is perfect for supporting girl-powered events and is a bold feminine statement. 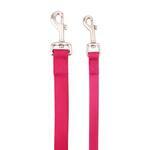 You will love the classic design of this nylon dog leash in Raspberry Sorbet. Available in multiple colors. Matching collars and dog harnesses are available too. New! Now smaller dogs and cats can enjoy more freedom with our slim 5/8" x 6' leash! Zack and Zoey Nylon Dog Leash - Raspberry Sorbet Customer Photos - Send us your photo! My girls attending the Paws 4 a Purpose Dog Walk! Our first new hoodies, love the Tomato Red for Ruby and the Raspberry Sorbet for Pinky! Posted On 10/15/18 by J.A. from Chicago, IL Yes, J.A. recommends this product! Leash matches my raspberry sorbet ombre harness, which is wonderful! Posted On 01/16/18 by Kasey S from Syracuse, NY Yes, Kasey S recommends this product! Goes with the harness perfectly and i love color!! Posted On 04/15/17 by Jessica L from Clinton, LA Yes, Jessica L recommends this product! I like the raspberry leash because it matches her harness of the same color. The no choke harnesses are so nice and we have to have a matching leash. Posted On 03/28/17 by Bonnie B from Dallas, TX Yes, Bonnie B recommends this product! Just what the safety doctor ordered! This harness was purchased for a Yorkie puppy. The fit is great. Also, this harness is Velcro free. Doesn't sound like a big deal, but it is in our household. Velcro scares the bejeeses out of my fur baby. My baby and I both love this harness! The harness and leash were purchased separately; but, the color match is perfect! Also very pleased with the size of the clip Fits well over harness rings. Posted On 02/17/17 by Tracey H from las vegas , NV Yes, Tracey H recommends this product! This is a great leash! Love the color, length & durability! Posted On 11/20/16 by Maggie M from Payson, AZ Yes, Maggie M recommends this product! Great leash at a very good price! Posted On 11/18/16 by Cheryl P from Highwood, IL Yes, Cheryl P recommends this product! Posted On 11/03/16 by Lilli VonSchtup from , MI Yes, Lilli VonSchtup recommends this product! Excellent leash! Not to mention that i like the color match to the other products/! Leash is strong with a solid clasp... what more could one ask for ,,, oh yes, inexpensive! Posted On 11/01/16 by Joyce J from Sarasota, FL Yes, Joyce J recommends this product! Love the color. It goes nice with the coat I ordered. The price is good. Posted On 10/27/16 by Ann Marie T from Holyoke, MA Yes, Ann Marie T recommends this product! Posted On 10/24/16 by Tracie from Ontario, CA Yes, Tracie recommends this product! Posted On 07/28/15 by Nicole R from , WA Yes, Nicole R recommends this product! Nice Quality. I should have ordered the longer leash for my small dog. Posted On 07/20/15 by Tammy S from , MI Yes, Tammy S recommends this product! Really nicely made leash. I love the raspberry sorbet one. It goes well with the new harness. Posted On 07/09/15 by Nancy T from Dayton, OH Yes, Nancy T recommends this product! This is a very nice leash , I love the color and it matches many of Bella's outfits from BaxterBoo including our most recent purchase of the choke-free harness -sugar plum . Thanks !!! Posted On 05/23/15 by Catherine R from , MI Yes, Catherine R recommends this product! Great sturdy leash that matches the bright collar colors. Nice sturdy clasp. Posted On 04/21/15 by Tammy S from Manistee, MI Yes, Tammy S recommends this product! Very nice leash. It matches my new harnesses perfectly. Posted On 04/11/15 by Ruth M S from Humacao, PR Yes, Ruth M S recommends this product! Zach and Zoey leashes do the job and are attractive, too! Posted On 11/10/13 by Laurel from Boise, ID Yes, Laurel recommends this product! We love the colors available in this Zach and Zoey leash (and matching collars). Ultra violet, bluebird, raspberry sorbet, parrot green---just the color names made us want to get these! We purchased these in the 4' lengths for rescue pugs. These leashes work wonderfully for these dogs, who don't need a super long or really strong leash. As a matter of fact, a lighter leash like this is just what these small dogs need. These leashes will last a long time, so pick the color you really love in the length that works the best for your dog. Be picky and wait if the color and length you want aren't in stock--you'll have this for 10 years or more! We liked getting the matching collars for these Zach & Zoey leashes. It really helps getting our rescues adopted, when potential families can see just how cute these little fellas and gals are with uptown styling! Posted On 11/07/13 by Bonnie D from Jenkinsburg, GA Yes, Bonnie D recommends this product! This leash has been perfect in training our new puppy. I love the bright vibrant color and also the amazing price!! This has been a great website. I always receive my items when expected, and me and my puppy really like everything we've ever gotten from here!! !